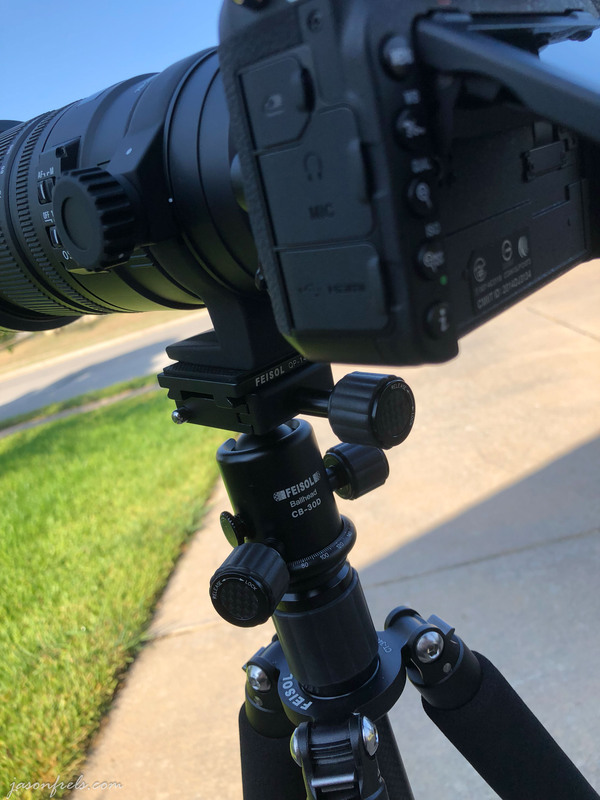 Today’s blog is more of a gear review than a photography discussion, but I wanted to write about a tripod that I recently purchased. I have been frustrated with my old tripod for quite a while and I wanted to get a better one. But, I didn’t want to just get a new tripod. I wanted to do it right and get a tripod that I would be happy using for years to come. I started off with a relatively cheap (<$150) tripod, like most people do, I think. It is a bit heavy, and clunky, and parts have fallen off of it. I then ended up purchasing a second cheap tripod as I was away from home and needed a tripod. And I found this tripod to be even clunkier. So, being a bit frustrated by this, I decided I was going to get a good tripod and not just a cheap tripod. It also needed it to operate smoothly and support my gear without slipping, which I have had a problem with on my existing tripods. My Nikon D750 + Sigma 70-200mm f/2.8 weighs less than 5 pounds total and I don’t really anticipate getting any of the heavy long lenses or flash attachments. One of my existing tripods has a clunky tilt-pan head and that is difficult to operate, so having a nice smooth, adjustable ball-head was a must. After doing research on and off for a few months while saving up money for the purchase, I came around to three options that I was considering. I was familiar with Manfrotto as a well regarded good tripod brand and Gitzo as a top professional brand. Feisol is a brand that I noticed and did a lot of research into because their equipment looked well-suited to my needs. There are several other brands that I won’t mention that I also considered. Below was my final decision matrix and as you can see, a good tripod can cost as much as a good prime lens. My main difficulty in coming up with these options was maximum working height versus folded length. I could find plenty of solid travel tripods, but they were almost all too short for my requirements. I also wanted a tripod without a center column, but those are less common and very expensive professional tripods. The minimum height requirements were somewhat mitigated by the ability to reverse the center column and mount the camera upside down at ground level. Of my choices, the Manfrotto would work, but it looked to be awkward to lug around. The Gitzo was highly praised, but didn’t fold up as neatly as I wanted and it is a very expensive professional tripod. The Feisol pretty much checked all of the boxes for all my needs and matched about what I was expecting to pay for a high quality tripod plus it comes with a carrying bag. I had a few technical questions about the tripod and head, so I submitted the questions on their website and they were very quick to answer. So, I purchased the Feisol CT-3441T tripod with the CB-30D ball head and it was delivered on Friday. Taking it out of the box, the first thing you notice is how little it weighs. I decided on carbon fiber construction for this reason and it makes a noticeable difference. On my recent hiking and camping trip at Lost Maples State Natural Area I really began to notice all the weight I was carrying (including my aluminum tripod) hiking in. Hopefully this carbon fiber tripod will be more bearable. It also folds up to be very easy to pack and carry. It does this by having fully reversible legs that fold up with the column and head to reduce folded length. 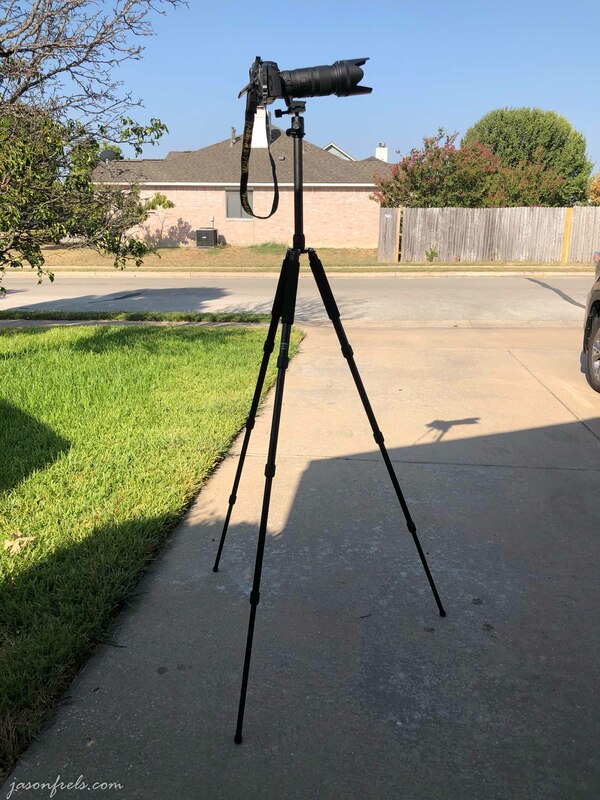 Below is a picture showing the new tripod along side my aluminum tripod. It is quite a bit lighter and shorter when folded. I also ordered a short center column as an accessory to allow you to reach minimum height of the tripod without the center column getting in the way. So, that somewhat mitigated my minimum working height concern. The attachment plate on this tripod is much easier to use than my existing tripod. The plate slides in and is secured with a quick twist of the knob. My aluminum tripod takes effort to carefully align the plate and fiddle with a latch. As you may be able to see from the picture below, there is a knob to tighten the attachment plate and a thumb button to release the safety catch – very quick and easy. The mounting plate on my old tripod had some noticeable slack or play and the camera could actually move a little. The mounting on the new ball head holds the camera very tightly and securely, which is a necessity for long exposure shots. With my camera and heaviest lens attached, it was easy to level the camera with the adjustable friction control and smooth ball head and there was no slippage when it was all locked down tight. Very stable. My only complaint might be that I typically hold my camera with my right hand, so I would rather the locking knob for the ball head be on the left. I am 6’4″ and I would like to be able to put the camera at a height such that the view finder is about eye-level so I can easily compose the picture without stooping. With the Feisol tripod fully extended, the camera can even be above my head. This might be nice for shooting over tall objects. The below photo shows the tripod fully extended with my camera and longest lens attached. It was very stable. I may order the L-bracket attachment in the future as it allows you to easily move from landscape to portrait orientation without having the head at an awkward angle. You can replace the feet with spiked feet for softer terrain. There are also heavier duty heads available to increase the supported weight if that is ever necessary. I set up the camera on the tripod on Sunday morning for some photos and found it to be very easy to use and very stable for the camera. A bonus feature is that I can change the camera battery with the tripod mounting plate attached. The legs have twist-locks instead of flip-locks. I don’t know which is better, but they both work for me. I can’t wait for a good sunset on a hiking trail somewhere. 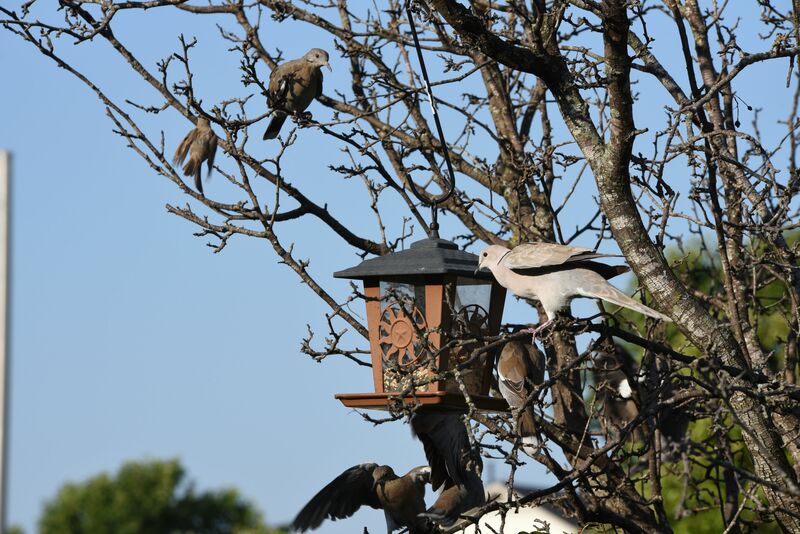 In the mean time, I shot a photo of the neighborhood birds attacking my birdfeeder Sunday morning. Thanks for reading my Feisol tripod review. I welcome comments or questions below. Interesting analysis. Some time ago I inherited a cheap but very stable and solid tripod ( Velbon CX 640 ) but I find that it’s just too heavy and bulky to carry in a day pack. I’ve tried all sorts of attachments but it always makes my back ache. I’ll be interested to know how you get on with your new purchase. Aside from the weight, the bulkiness of my other tripods was also annoying. I couldn’t fit it in a backpack or suitcase without a lot of disassembly. This, hopefully solve that problem as well. I am going on a little trip next week so maybe I will get some good experience lugging the new one around.